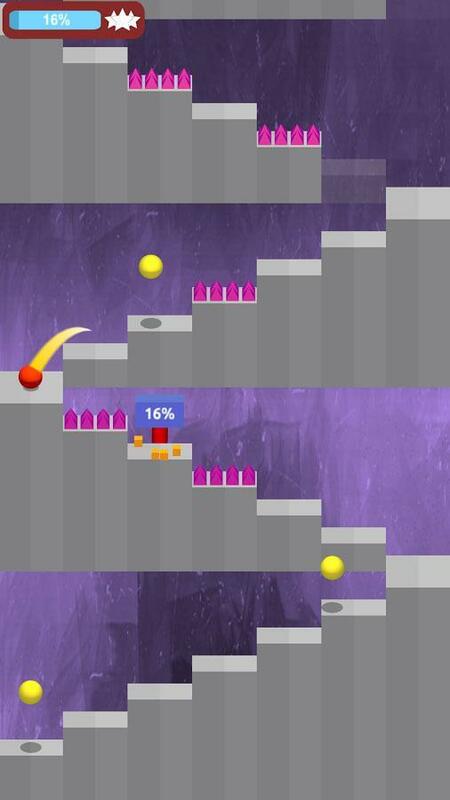 Guide the red ball as it bounces its way to the portal at the end of the staircase in this fun casual game, Jumpy! Be careful though - you would want to avoid anything pointy lest your red ball gets itself punctured along the way. Test and hone your timing skills and reflexes in Jumpy now! To start, you’ll need to know how the game works. It’s simple, really. 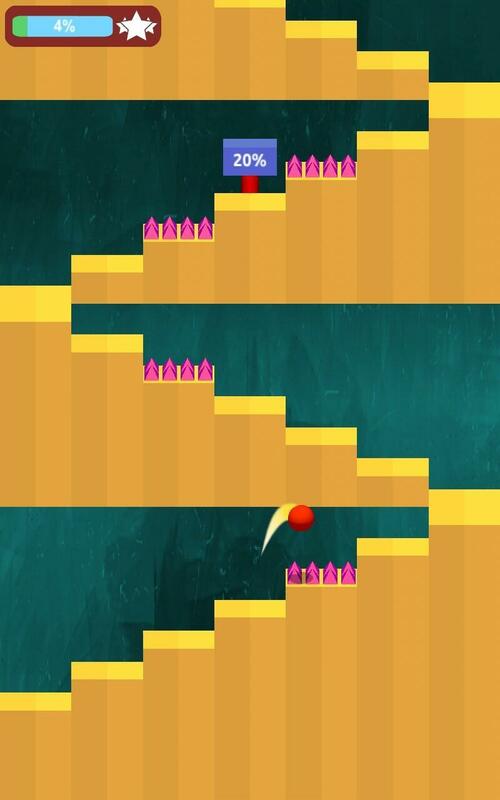 In Jumpy, you just need to tap to make your red ball jump over a step on the staircase. You’re not required to tap every time you need the ball to bounce though – it does that on its own just fine. After all, it is a very bouncy rubber ball! That being said, the staircase that leads to the portal to the next level is riddled with traps and obstacles that you must try your very best to avoid. The most common danger you’ll encounter is the spike traps. By timing your jumps properly, you should be able to get your ball across safely without too much of a hitch. Of course, having great reflexes to, for example, leap over an unexpected obstacle, doesn’t hurt either. 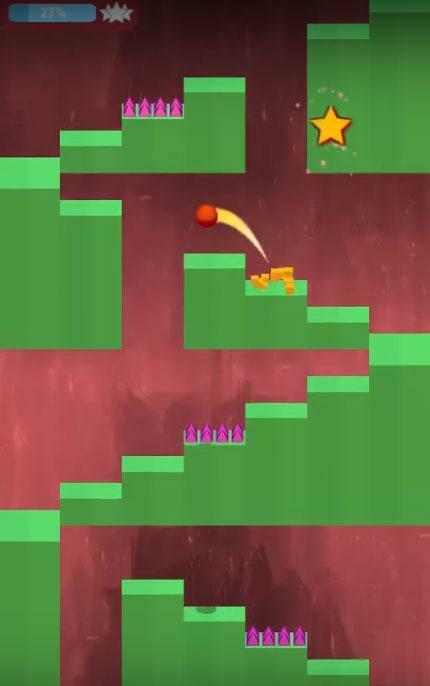 However, as you progress in the game, more challenging obstacles will pop up, such as yellow balls that bounce down (instead of up) the stairs to distract you, steps that disappear and reappear at specific intervals, direction-changing diamonds, and also retractable spikes that will make you wonder if this game is out to get you.... or not! These challenges made the game so much more fun and exciting to play, and let’s not forget that the tougher the challenge, the sweeter the victory! There is only 1 game mode for you to play in Jumpy at the moment – the levels mode. However, the developer behind the game will be adding another game mode, called the “high score” mode, which is basically the endless version of Jumpy. The game itself boasts of having up to 10 exciting levels, but of course, you can bet on it that more levels will be added in the future! Interestingly, Jumpy provides a new soundtrack for every different level in the game. This is a rare occurrence among casual games, as most games usually just loop the same music over and over again. The game also has a leaderboard feature whereby you can see your rank among the other players who are playing Jumpy. If you love the game, you might want to consider supporting the developer of this amazing app. As the game doesn’t have boosters, or a life, health or energy system to restrict your gameplay, there isn’t any in-app purchases that you can make. However, you could always buy the ads-free version of the game to let the author of this app know of your appreciation. Jumpy is, after all, a decently-made and fun casual game! All in all, Jumpy is a rather addictive and entertaining casual game that is easy-to-learn yet challenging to master. Do expect a lot of intermittent frustrations, at getting your red ball popped, and triumph, at getting through a particularly tricky spot, when you’re playing Jumpy!